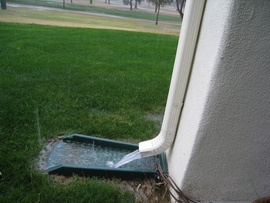 Portable channel placed underneath a downspout to receive roof drainage and guide water away from a home or building. If a downspout is not connected into gutter drainage, a splash block is needed to prevent water from pooling around the foundation and seeping in. This prevents leaks and cracks in your foundation as well as soil erosion in your yard. Splash blocks are generally under $10 per piece, although decorative cast aluminum versions can run as high as $70.